Most of the very best ghillies I've been fortunate to meet and fish with throughout my career have all had an uncanny knack of creating the most amazing & instant 'one liners' from their acute sense of humour that would leave any fishing hut's occupants in absolute stitches! 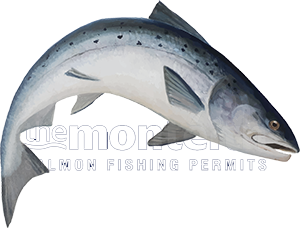 The professional ghillie's ability to entertain his fishing guests goes a long way to filling up any salmon beat with regularly returning fishing guests. These 'rare' hospitality skills can also fill local hotels & bars such is its potency for the entire local economy. A professional ghillie needs to also be a true technician at catching salmon as only that level of expertise could ever be effective for showing clients the best tactical approaches. On the bigger River Tay that involves not only being tactically lethal with a salmon fly rod but also with a spinning rod and from the boat whether it be traditional 'harling' or anchoring up and roping down through a salmon pool. Being able to 'ghost' in to a visiting salmon fisher and make an effective salmon fishing adjustment to the presentation of their fly to then achieve the desired 'silver' result is part of the magic a true professional will bring to the table. The head ghillie should be able to correct any guest behavioural situation that's spiralling out of control without the fishing guest even knowing he been cautioned! A true pro will re-align the non compliant behaviour of a fishing guest with humour and grace leaving the guest educated and not offended. A high level of people skills are crucial for any beat ghillie to possess and especially a head ghillie. The art of that 'delicate' level of communication isn't easy and takes time to master but once mastered then what a great weapon for additional annually returning fishing guest business. A true professional who's enthused and on top of his game and not just viewing things as a 9am to 5pm job will want to be at the fishing hut between 7.30am & 8am getting everything ready for the arrival of his guests. Nothing is worse for a visiting salmon fisher than waiting for the ghillie to show up. A ghilllie has the luxury of going to the river everyday so he needs to have respect for his guests who only get the chance to visit the salmon river very occasionally. From personal experience I know that a 'detached' beat owner can affect the attitude of the ghillie but better to take these indifferences out directly with the beat owner and never let the fishing guests sense an employment disgruntlement. Keeping the fishing hut immaculate shows respect for the visiting salmon anglers and head ghillie self pride and a good sweep out at night and keeping the hut tidy & organised goes a long way towards the guest's fishing experience. The same with the riverbank maintenance and a true professional will time his annual beat grass cutting just right for longevity for the fishing guest's ease of fishing and not prematurely just because the boss man's due to make an appearance! A tidy fishing hut & well maintained riverbanks are great to see and brilliant for the guests, the fishery and repeat bookings. When you meet one of these true professionals that Scotland is fortunate to have an army of then you'll no doubt quickly form a relationship that will last a lifetime. That has certainly been my experience and although on paper catching salmon is the main obvious attraction I'd say there's definitely much more reliability and value from the bond between the angler and the man who heads up the fishing operation when you meet one of these true Scottish salmon fishing ambassadors if you haven't already met plenty!